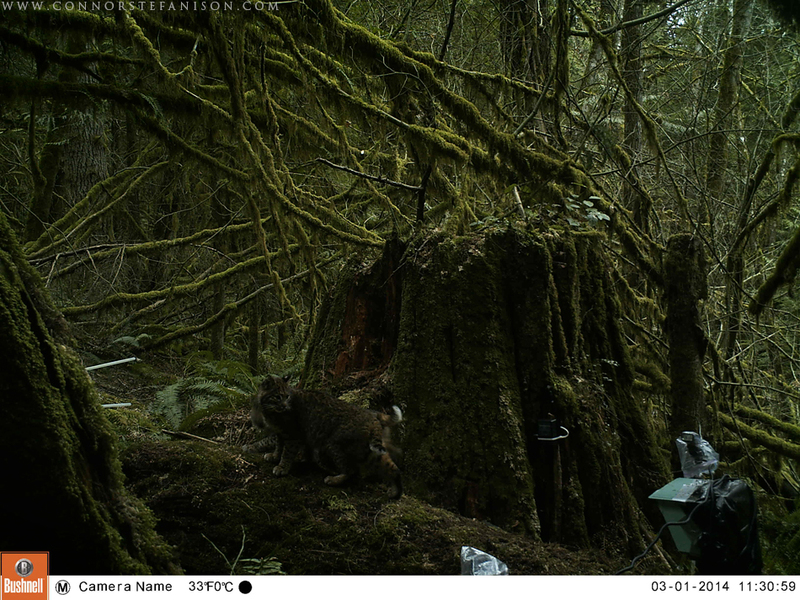 Camera trap photography isn’t new, but it’s certainly gaining in popularity. 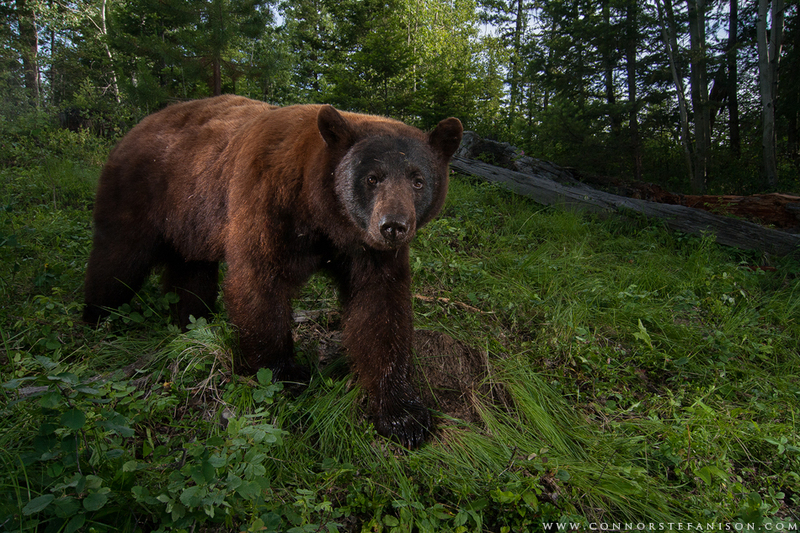 Here at Camtraptions we want to promote this creative and often challenging form of photography by interviewing those making headway with camera trap systems. Our first such photographer is Connor Stefanison. 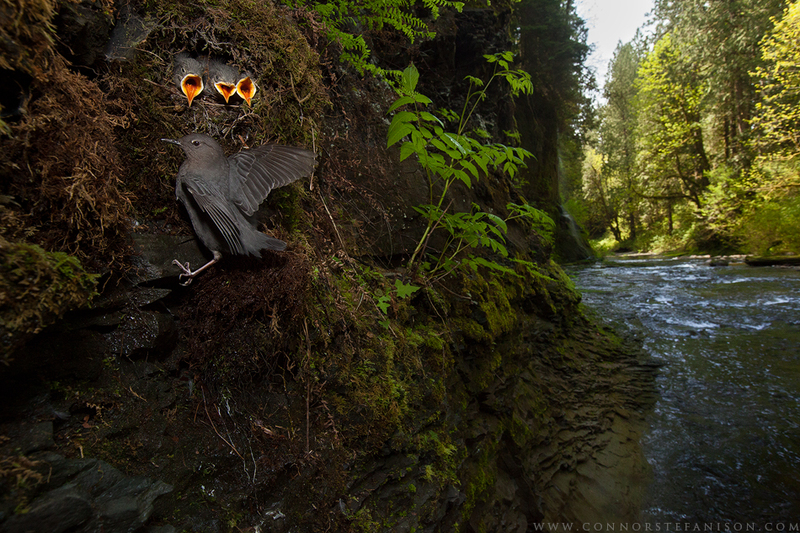 Living on the Pacific coast in British Columbia, Canada, Connor has learned about wildlife and wilderness firsthand. 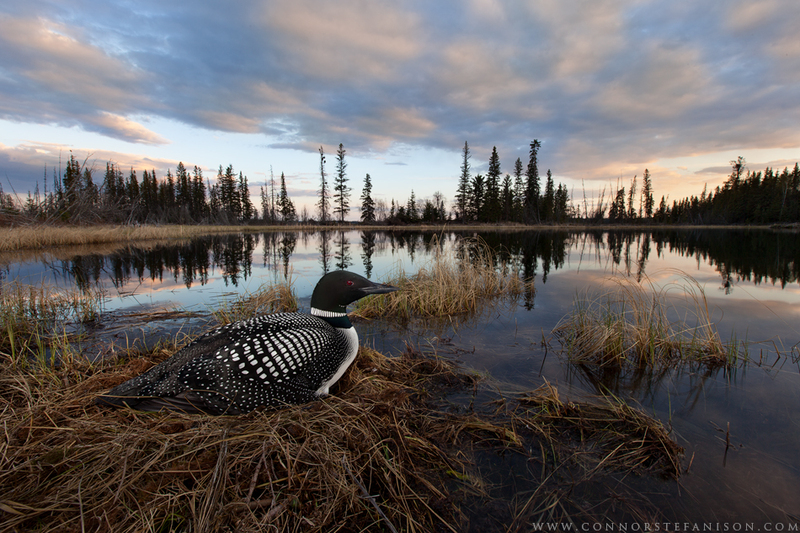 His photography draws from knowledge gained throughout his life pursuing outdoor activities such as fishing, hunting, wildlife viewing and, camping. It was mountain biking that first sparked his interest in photography, which he took up in 2008 at the age of 17. Having such an outdoor oriented background, his focus quickly switched to nature photography. In 2013 Connor was awarded the Eric Hoskins Award in the BBC/Veolia Wildlife Photographer of the Year and was also a speaker at the WildScreen conference (formerly WildPhoto) during the awards week in London. To add to his growing repertoire of skills, Connor has also recently completed a biology degree in ecology and conservation with the hope of becoming a conservation photojournalist. Before I was even into photography I remember seeing a TV news story about Steve Winter, winning Wildlife Photographer of the Year (WPY) with his snow leopard story. They showed a behind the scenes story about his adventures in central Asia, and that is where I first learned about what a camera trap was. Then after following more of his work, and other photographers like Joe Riis, I was extremely eager to give it a go. I talked to a few people about what to buy, and I finally built my own trap. 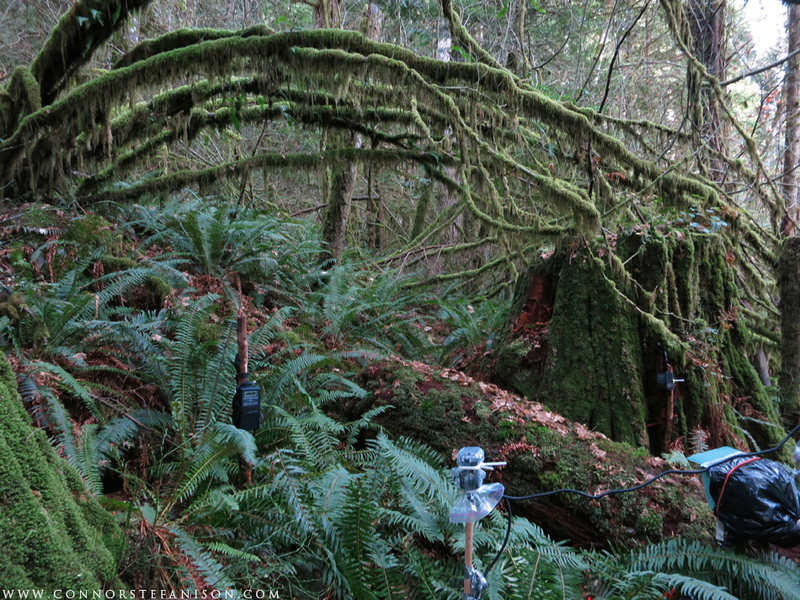 I then started learning about other great camera trappers like Michael Nichols, Joel Sartore, Paul Colangelo, Sebastian Kennerknecht, and Jonny Armstrong, and was even more inspired to get my trap out in the forest. I’m sure this answer is the same for everyone, but the biggest advantage is being able to capture images that would be almost impossible to capture if you were standing there. Many species are quite elusive, and even just catching a glimpse of them is an achievement. Camera traps are often the only way to capture close images of these species. Without camera traps, we would know much less about animal behaviour, and many in the general public would be unaware of the conservation issues that these elusive species face. Another advantage is that you do not need to be sitting in a hide for weeks, waiting for your target species to come by. This past winter, by using a camera trap, I was capturing images of bobcats while sitting in a lecture hall writing university exams! The biggest disadvantage I can think of is not knowing when the subject will show up, and what its body position will be. I always compose my setups to look like how I would take them if I were standing there, but I have no control over the animal’s position when it breaks the beam. If I’m shooting a nocturnal species, I’ll set a fast manual exposure. If it’s a diurnal species, I’ll use a manual exposure if I can, by setting up during the brightest time of day, or I’ll just set the camera in aperture mode and see what happens. The risk of using an automatic mode like the aperture mode, is having the animal come by at dawn or dusk and getting a 30 second exposure. 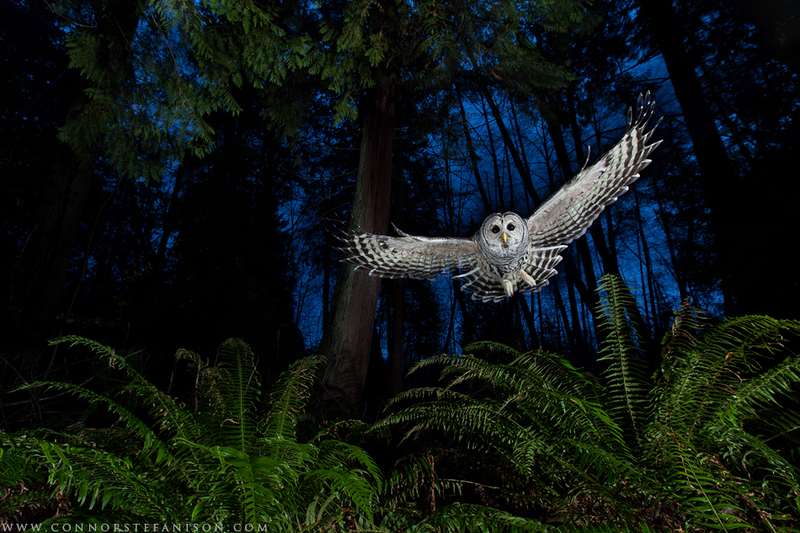 "If I’m shooting a nocturnal species, I’ll set a fast manual exposure. If it’s a diurnal species, I’ll use a manual exposure if I can, by setting up during the brightest time of day, or I’ll just set the camera in aperture mode and see what happens. The risk of using an automatic mode like the aperture mode, is having the animal come by at dawn or dusk and getting a 30 second exposure." 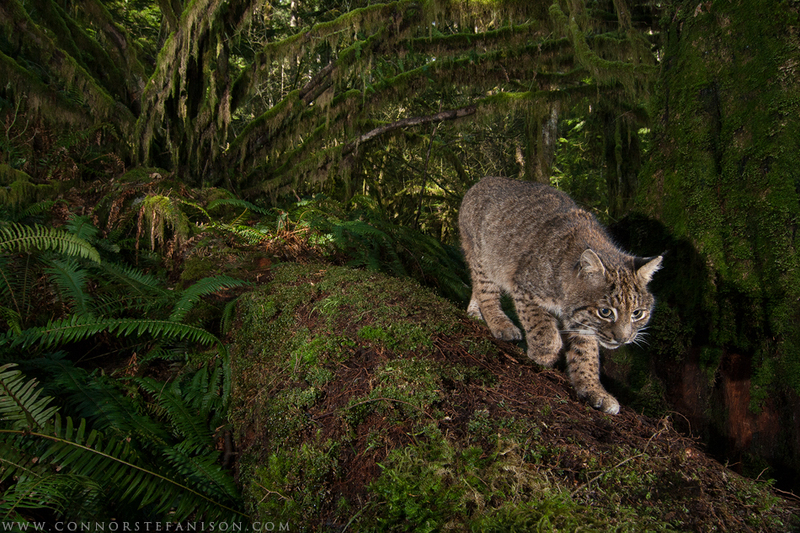 Most of my camera trapping has been done in the Vancouver area of British Columbia. I’m still very new to camera trapping, so I haven’t experienced it all yet. Living in Vancouver, the biggest issue I face is condensation on the outside lens of my protective housing. It’s raining all the time here, and the forest that I’ve been setting up in is very damp and foggy. If it rains while my trap is out, I can almost always count on it fogging up, even with a large lens hood on my housing box. I’m often alone when I build my setups, so I only try to bring what I’m sure I’ll need. I’m sure there are ways to lighten up my trap system, but I’ll leave it be for now since everything works. So far I can fit everything into one large backpack and I’ll carry my housing box by hand. I’m not too sure if my setup is super specialist or not. I don’t know much about the other systems, so it’s tough to compare mine to them. With most things though, simplicity is best. This past fall, winter, and spring, I made my first real effort to learn how to use a camera trap. 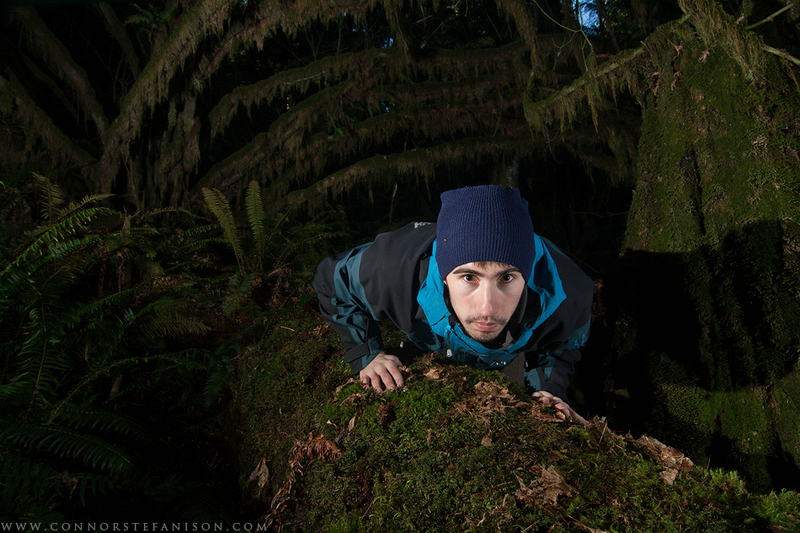 Setting up in a local rainforest, I dispersed some raw deer bones in the area to see what would come by. I figured that by using this to attract animals, I could speed up my camera trap learning curve by attracting frequent subjects. I ended up getting a bobcat just about every week that I checked the camera. I consider this to be my most successful and most unsuccessful project. It was unsuccessful because it took me 6 months to get a decent photo while using bait. It was successful because of how often I would get images. Overall it was a really good learning experience. When I was trying to get the bobcats, I had some issue almost every week. These issues include things like: rain, flashes not firing, poor flash placement, condensation, or the bobcat not showing up when everything was perfect. 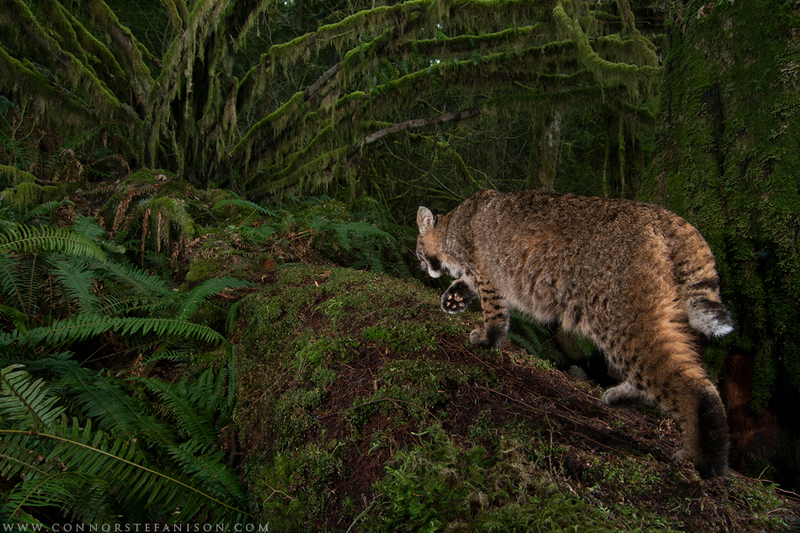 My biggest failure was definitely the time where a bobcat came to the scene a bunch of times during the week, during every type of lighting condition, and I forgot to turn on the camera. I knew that it had visited all those times because my Bushnell trailcam was recording it. 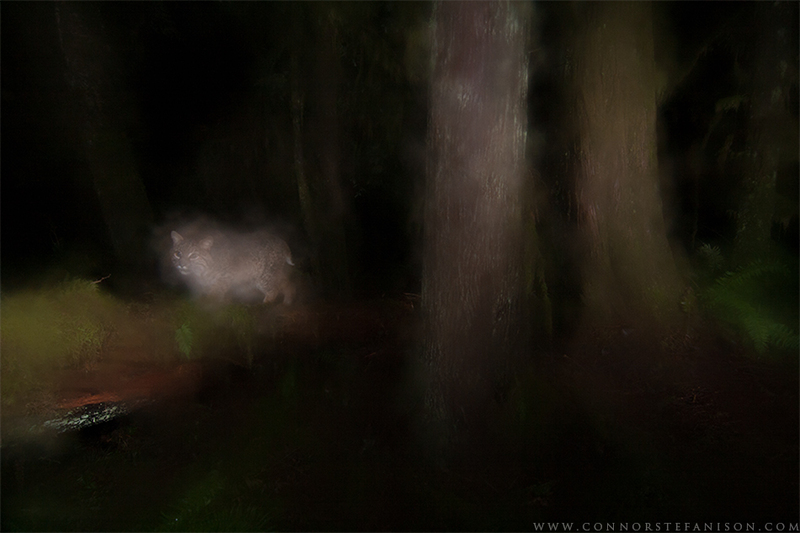 I remember changing my memory card right before leaving the camera trap site. I always turn off the camera before changing cards, and this time I just didn’t turn it back on. I now have a checklist on the inside of my housing box that helps me remember everything. "When I was trying to get the bobcats, I had some issue almost every week. These issues include things like: rain, flashes not firing, poor flash placement, condensation, or the bobcat not showing up when everything was perfect." I definitely wouldn’t say that it’s cheating. 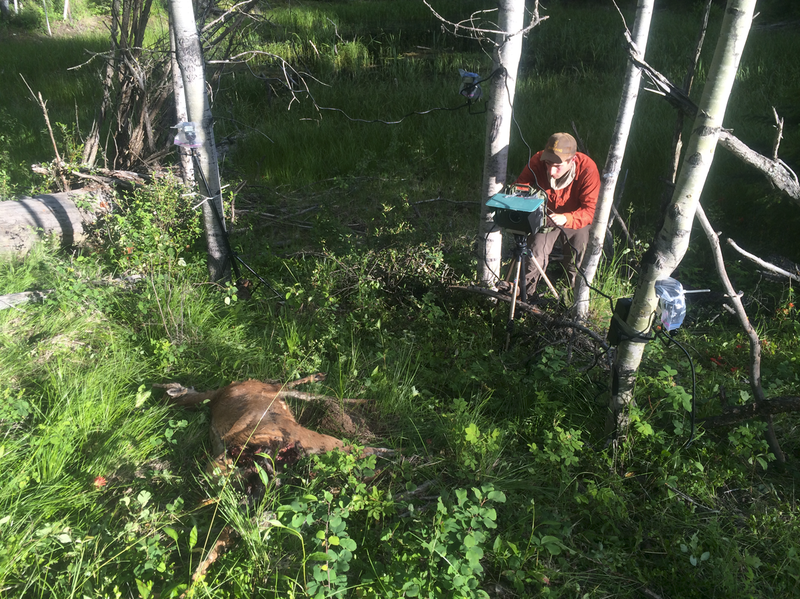 If you’re using an active (animal trips a single beam) camera trap system, you are ensuring that the animal will be almost exactly where you want it in the frame. Many people seem to think that camera trapping is just pure luck, when in fact there is often more preparation than taking a handheld photo. I think that people should try camera trapping first before calling it cheating or not. I definitely see it having increased growth, but nothing exponential. Whenever I post something about camera traps on facebook, I get a bunch of messages after from people who want to get into it. Because it’s a very fun and technical type of photography, I can see why there is so much interest. The main thing holding people back is figuring out how to build a fully functioning trap. It can be quite complicated to get everything working properly. If nothing else, I think using handheld wireless remotes will start to become more popular. Wireless remotes are super simple to set up, and are also quite inexpensive. You can buy 10 wireless remotes for the price of one camera trap trigger. At the moment, I think some of my best images were taken with a wireless remote. The opportunities these remotes can bring you are well worth the investment.